In an attempt to woo tourists to Jewel Bay and cheer up the townies, Erin Murphy, manager of the specialty local foods market known as the Merc, is organizing the First Annual Food Lovers’ Film Festival, filled with classic foodie flicks and local twists on favorite movie treats. But when her partner in planning, painter Christine Vandeberg, is found dead only days before the curtain rises, Erin suspects someone is attempting to stop the films from rolling. 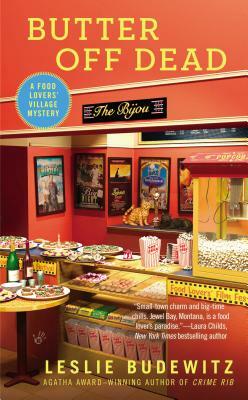 Leslie Budewitz is passionate about food, great mysteries, and her native Montana. She is the author of the Food Lovers’ Village mystery series, including Crime Rib and Death Al Dente, as well as Assault and Pepper, the first book in the new Spice Shop mystery series. Also a lawyer, her first book, Books, Crooks and Counselors: How to Write Accurately About Criminal Law and Courtroom Procedure, won the 2011 Agatha Award for Best Nonfiction and was nominated for the 2012 Anthony and Macavity awards. Leslie loves to cook, eat, hike, travel, garden, and paint—not necessarily in that order. She lives in northwest Montana with her husband, Don Beans, a doctor of natural medicine, and their Burmese cat, Ruff, an avid bird watcher.